Impressively directed and impeccably researched, this is an extremely entertaining documentary that's a must-see for Hicks fans and a great introduction for the uninitiated, although there are a couple of frustrating omissions. 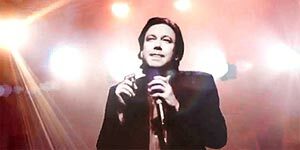 Directed by British filmmakers Matt Harlock and Paul Thomas, American: The Bill Hicks Story is a documentary about outspoken American comedian Bill Hicks, who died from cancer in 1994 when he was just 32 and at the height of his career. With talking head contributions from his friends and family, the film traces Bill's life from his teenage years in Houston (when he would sneak out at night and perform in comedy clubs, aged 15), through building a reputation on the LA comedy circuit, to the inevitable period of alcoholism and drug abuse before finally kicking his addictions (nicotine aside), after which his act became noticeably more political and controversial, to the point where he would get repeatedly censored on US TV shows and instead became a star in the UK. Harlock and Thomas have assembled a wealth of terrific archive material that includes still photographs, home movies and grainy video footage of Hicks' early comedy club appearances, proving that even as a teenager, he was already a gifted comedian. The film also uses the same animated photo technique as The Kid Stays in the Picture, which helps bring the material to life and gives the film a distinctive visual style. What sets the film apart from the standard documentaries about comedians is the notable absence of glowing tributes from other famous comedians; instead, Harlock and Thomas limit themselves to just ten talking heads, including best friends Dwight Slade and Kevin Booth and family members Lynn, Steve and Mary (respectively, Hick's sister, brother and mother). This gives the film a much more personal feel, although, curiously, the film doesn't include interviews with any of Hicks' ex-girlfriends, so that side of his life feels almost airbrushed out by comparison. Unfortunately, the film's omissions don't end there - for example, the film is frustratingly vague on what exactly led him to politicise his stand-up material and you're left with no real sense of where his anger came from. American: The Bill Hicks Story is an entertaining, well made documentary about a gifted comedian who was, in many ways, ahead of his time and whose messages are just as relevant today. Highly recommended.